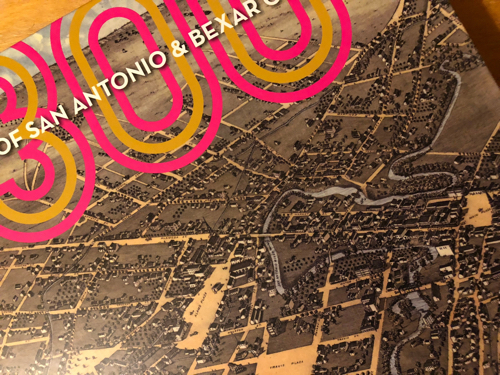 During his long life in San Antonio, the large Urrutia family travelled often along the length of Broadway, from the downtown medical complex to the family home located at the midpoint of Brackenridge Park to the gardens at Miraflores, then at the city’s northern edge. Yesterday, I had the pleasure of meeting the multi-talented Tim Palomera, a lifetime San Antonian, who has been thinking about how places in San Antonio are connected--both in time, space and memory. Palomera served the City of San Antonio as City Architect from 1984 to 2005. He has, throughout his life, collected all types of San Antonio memorabilia, and now finds himself with an amazing archive of San Antonio history. 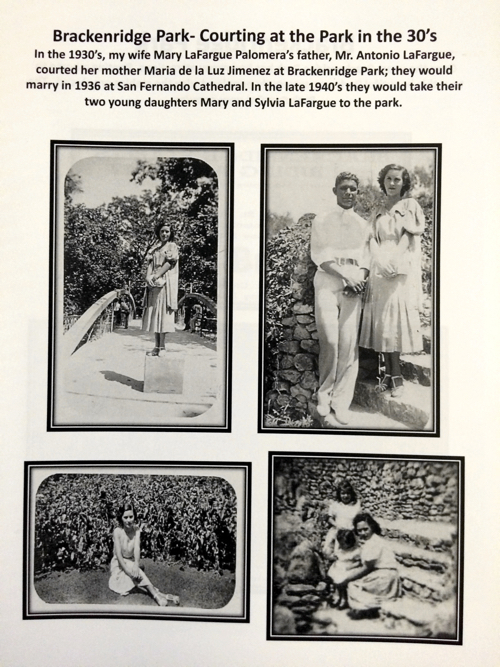 He began putting his knowledge into self-published volumes as a genealogy project, to communicate family history to his children. But Tim's career as an architect gave him a special sensitivity to place. He noticed that he tended to couch family events and even the memories of his parents in terms of location. He remembers how his family sat outside The Light building at Broadway and Fifth to watch his son march in the Central Catholic High School Band for Battle of Flowers. He remembers as a young architect working with Barlett Cocke, "a great talent and a true gentleman," and the architect's office near Brackenridge Park. 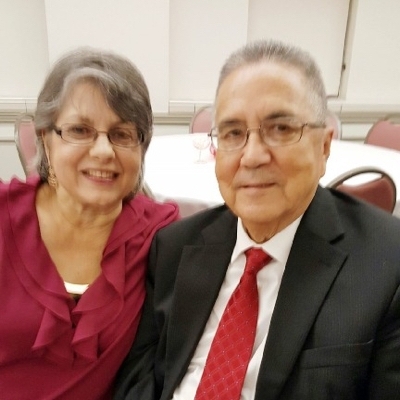 He remembers the Mexican Social Clubs of the 1950s and 1960s, some of which were held at the USAA Ballroom when its headquarters was on Broadway. So Palomera started using his archive of collected materials--family photographs, advertisements, old maps, old matchbooks, and much more--to compose what he calls "walks" or "strolls" to create picture book volumes which depict elaborate histories of the visual and remembered history of San Antonio. This stroll down memory lane begins on Broadway at Houston St. 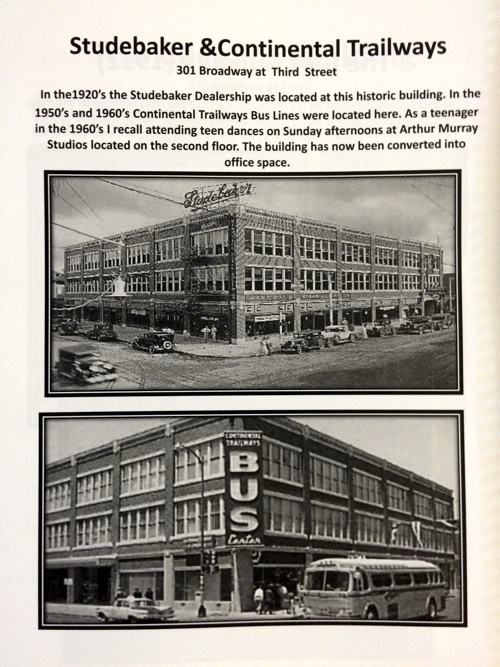 It proceeds northward on Broadway recalling buildings, car dealerships, drive-ins, parks, and boyhood memories. We stroll briefly off Broadway for some pleasant surprises. I've included family and friends who lived or played in this area. I hope this historic stroll leaves you with Sweet Memories of a bygone era. Tim has created a number of volumes of historic walks, including Houston Street, South Flores, North Flores, Historic Fredericksburg Road, Historic Downtown Westside Stroll, and Historic Cementville. My friend, Pat Jimenez, who I met through her effort to return a Miraflores relic to the garden, introduced me to Tim because she knew his Broadway stroll would interest me. 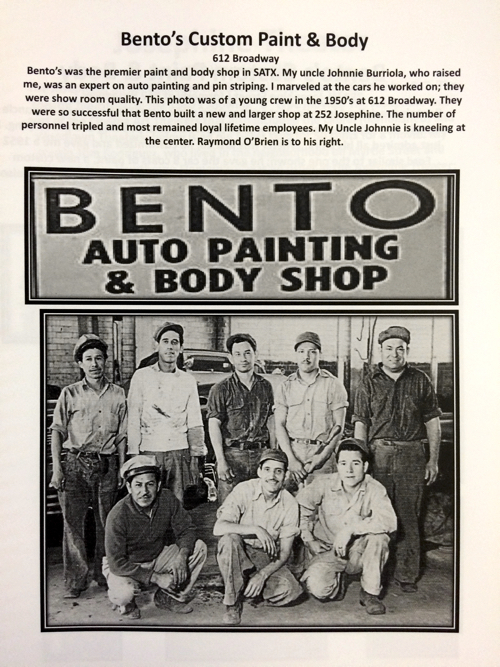 From his survey of Houston Street, Palomera first became interested in the Urrutia family, because he knew that Doctor Urrutia had built an office complex between Laredo and Santa Rosa Streets, where the Rosa Verde Towers now stand. The complex included offices for himself and his physician sons, an outpatient surgical facility, and Farmacia Urrutia, run by his pharmacist daughter. Tim's wife, Mary, who grew up near the offices, recalls her mother, who was a patient of Urrutia, once brought home a salve given to her by the Doctor to soothe a rash on her hands. It was black, in a small white jar, and smelled strong, much like kerosene actually. My mother would cover my hands with it, and wrap them in cloths, like home-made gloves. And it worked! It only took a few times of using the treatment and the rash was gone. As a part of his Broadway project, Tim highlights Urrutia's home, Quinta Urrutia, which was at 3225 Broadway, and ventures off of Broadway at Hildebrand to explore Miraflores. 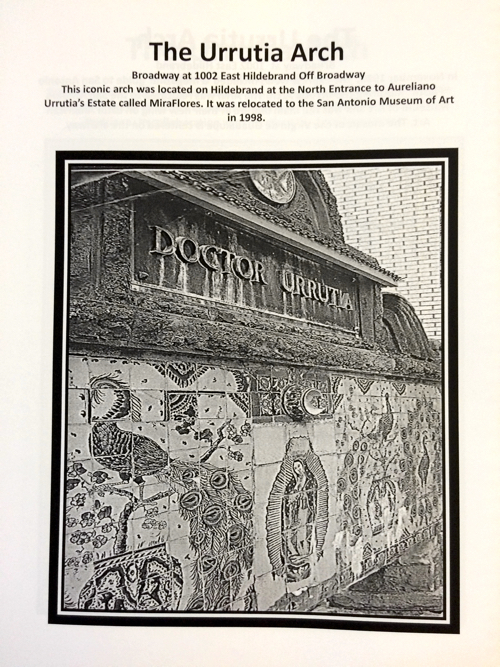 The pages include items from Palomera's collection of San Antonio memorabilia, including a 1920s map of the area, old phone directory pages, a 1998 magazine cover, old newspaper article photos, and a postcard featuring Xochimilco, Mexico, which was Urrutia's birthplace. Palomera uses a variety of his own family photos in his work and here he includes several taken in Xochimilco. He also includes photographs from his own visit to Miraflores. It may not all be exactly correct. I'm more interested in getting the story out there, so sometimes I just fill it in with memories, or what I think is true. I laugh when Tim tells me this, and respond that Doctor Urrutia would be just fine with that. Because, in fact, my great grandfather did the same thing. He often told stories about the objects in his collection--sometimes they were factual and sometimes the tales were imaginative stretches. I can just see him now, smiling down, at me, Tim Palomera, and the ongoing story of la familia Urrutia en San Antonio. About Tim Paolomera. An architect for over 35 years, Tim graduated from the University of Texas in 1970. He worked for Reginald Roberts, Architect; Bartlett Cocke & Associates; and the Veterans Administration before joining the City of San Antonio as City Architect in 1984. Tim retired from his City position in 2005. He has practiced as a mosaic artist for over 25 years, and for the past six years has created his beautiful self-published books, which he calls historic “street strolls and memories." 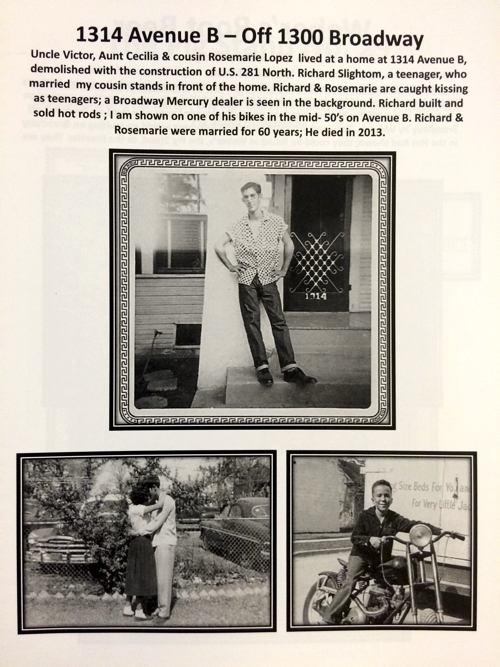 Photo of Tim Palomera and his wife, Mary, and photos of Tim’s pages used by permission.